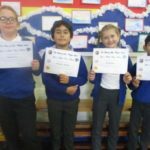 On Tuesday 6th November four children from Year 5 attended a Maths Challenge Competition at Old Palace School in Croydon. They had to complete 10 challenges which included tangrams, word problems and shape. They competed against lots of other schools and came first.